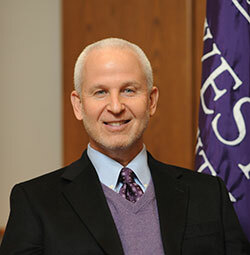 Morton Schapiro began his term as the 16th president of Northwestern University on September 1, 2009. He is a professor of economics in Northwestern’s Judd A. and Marjorie Weinberg College of Arts and Sciences and also holds appointments in the J. L. Kellogg School of Management and the School of Education and Social Policy. President Schapiro is among the nation’s leading authorities on the economics of higher education, with particular exper­tise in the area of college financing and affordability and on trends in educational costs and student aid. He has testified before US Senate and House committees on economic and educational issues and is widely quoted in the national media on those issues. Previously President Schapiro was president of Williams College from 2000 to 2009. Earlier he had served as a member of the Williams College faculty from 1980 to 1991 as professor of economics and assistant provost. In 1991 he went to the University of Southern California, where he served as chair of the Department of Economics until 1994 and then as dean of the College of Letters, Arts and Sciences until 2000. During his last two years as dean, he also served as the university’s vice president for planning. President Schapiro has written more than 100 articles and written or edited nine books. The books include: Cents and Sensibility: What Economics Can Learn from the Humanities (with Gary Saul Morson, Princeton University Press 2017); The Student Aid Game: Meeting Need and Rewarding Talent in American Higher Education (with Michael McPherson, Princeton University Press 1998); Keeping College Affordable: Government and Educational Opportunity (with Michael McPherson, Brookings Institution 1991); plus an edited volume: The Fabulous Future? America and the World in 2040 (with Gary Saul Morson, Northwestern University Press 2015). He has received research grants and contracts from the National Science Foundation, the US Department of Education, the World Bank, the Andrew W. Mellon Foundation, the Spencer Foundation, the College Board, the Organization for Economic Coopera­tion and Development, and other groups to study the economics of higher education and related topics. In 2010 he was elected a fellow of the American Academy of Arts and Sciences, and in 2017 he was elected to the National Academy of Education. He received his bachelor’s degree in economics from Hofstra University and his doctorate from the University of Pennsylvania.